US theme parks operator Six Flags could still build a theme park in Saudi Arabia, after a directive issued by Dubai’s Ruler said Dubai Parks and Resorts would support any proposals to open a theme park in the kingdom. The directive from Sheikh Mohammed bin Rashid, Vice President and Ruler of Dubai, said the company would provide all forms of support for any potential new theme park. Raed Al Nuaimi, the chief executive of Dubai Parks and Resorts, said: “We are proud to support the vision of His Highness Sheikh Mohammed to increase tourism and diversification, and to work together for the benefit of the GCC region. Six Flags’ chief executive, John Duffey, and executive chairman, Jim Reid-Anderson, last week met Mohammed bin Salman, Saudi Arabia’s deputy crown prince, to discuss potential opportunities in the kingdom, as Saudi Arabia seeks to increase tourism numbers to the country as part of its Vision 2030 national transformation plan. Mr Duffey was quoted by a Saudi TV station as saying the company was “very honoured to be provided with an opportunity to enter into a partnership” in the kingdom. However, a company spokesman later said the only deal currently in place in the region was at the Dubai Parks and Resorts site in Dubai, and that “no agreement has been reached to open any parks elsewhere in the Middle East”. 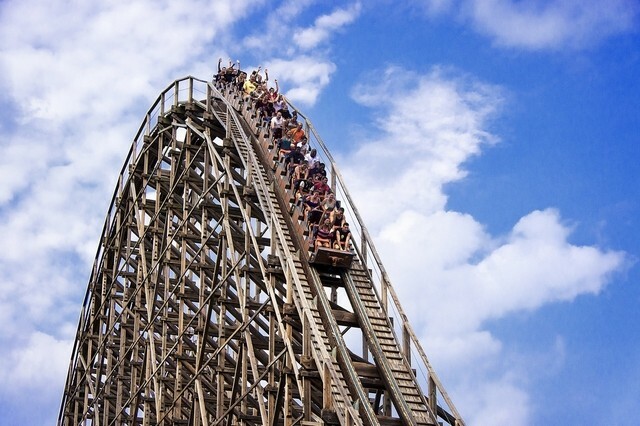 Six Flags is the biggest amusement parks operator in North America, where it has 18 parks that were visited by 29 million people last year, generating US$1.3 billion in revenue. Its agreement with Dubai Parks and Resorts will see a new 3.5 million square foot plot containing 27 different rides and attractions being developed at a site close to the emirate’s border with Abu Dhabi. The park will cost Dh2.6bn to build and is scheduled for completion by the end of 2019.